For businesses to fully implement goal-driven lean strategies through Total Productive Maintenance (TPM), they need more than a simple toolbox of everyday solutions. As the name may suggest, TPM is not a maintenance-only initiative but rather a total plant operating strategy. TPM calls for a complete top-to bottom diagnosis of how a given organization operates, how its equipment is maintained and how it creates standards by which performance is measured, as well as a keen eye toward optimized MRO spend management, uptime retention, asset availability and more. At its core, however, a successful TPM deployment starts with Autonomous Maintenance. When asset-intensive businesses can rely on equipment operators to capably handle small, simple repairs and replacements, they strengthen equipment reliability and support their highly-qualified maintenance professionals by giving them more time to do preventive and predictive maintenance work. What is line-centric accountability (LCA)? Sustaining gains through any continuous improvement Kaizen type event is likely the biggest challenge for leaders today. LCA is simply dedicating a set of line leaders—Operations, Maintenance and Process—who are 100% accountable for driving improvements and deploying TPM practices on a set of lines. Philosophically, this is a great tool to break traditional silos and ensure cross functional teamwork with a singular objective of reducing losses while building the capability of operators and technicians on the lines. While LCA it is a resource for effecting change across the largest population at your plant (operators and technicians), it is also an excellent test-bed for training your future leaders who take on larger responsibilities and come ready with a continuous improvement or “no silo” mindset and hands-on people development experience. Fueled by day-by-day or shift-by-shift losses, LCA brings together the brightest minds at your company to work with the operational lifeblood of your organization to improve Overall Equipment Effectiveness like never before. Before venturing down the path to LCA and greater TPM, your LCA team of engineers will require a holistic view of the value of production. Uncovering and naming bottlenecks is an important part of this process. Where are the hang-ups on your line? What are their root causes? How detrimental are they to OEE, and how much can you reclaim by eliminating them? In addition, LCA team member collaboration on a working OEE formula will further promote a lean environment moving forward. After all, without a complete understanding of all the facets a key performance indicator like OEE entails, how can a business expect to intelligently audit and validate its own processes? “Good Count” is the number of finished goods produced over a certain period without rework. “Cycle Time” is the minimum amount of time needed to produce one product. “Planned production time” is the total expected production time minus scheduled losses. “Availability” is net run time divided by planned production time. “Performance” is the ideal cycle time multiplied by gross count, including defective products. Then divide the factor of those two variables by gross run time, including downtime. “Quality” is simply good count divided by total count. Do you have metrics at the ready to help your LCA team analyze every variable in either formula? Once an LCA team has gathered all this data, it’s time to turn that information into action. 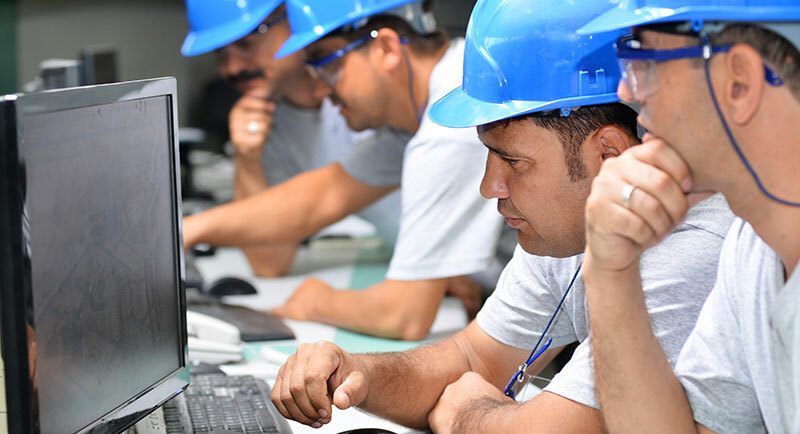 Team members should begin drafting daily or shift-specific work plans that reinforce on-site OEE and continue improving upon Autonomous Maintenance and Preventive Maintenance practices. In these discussions, LCA teams should think about operators as the skilled technicians they are or can be with training. This is the fundamental principle of TPM. Next, LCA teams will need to collaborate with line workers to discuss the operational changes that could correct any observable losses and any efficiency gaps that require plugging. Engaging operators here is crucial, as it encourages their advocacy for the changes to come. After operators have aired their pain points, LCA teams must develop a foundational standard operating procedure (SOP). Consider this SOP a living document subject to error and evolution. As we mentioned before, line-centric accountability is an iterative process. LCA teams will introduce a method for standardizing work. Operators will carry it out and report on its efficacy. Both will decide how best to move forward. Following the standardization of normal work, LCA teams must then do the same for maintenance it expects operators to oversee. With help from loss data, technicians should receive Preventive Maintenance assignments that target specific issues, but do so according to the rules of standard work. Why? So work order fulfillment isn’t contingent upon who works what shift. When all technicians work in the same fashion and with the same working knowledge, work schedules won’t affect results. Other issues will crop up, and businesses must have the flexibility to allocate resources toward these problems before they balloon out of control. As a rule of thumb, LCA teams and operators should devote 80 percent of their effort toward TPM integration and save 20 percent for all else. Daily accountability tracking and leadership audits aid in the endeavor, as they ensure AM/PM operations strive to improve losses at least four-fifths of the time and no less. Finally, as stated above, LCA project managers and operators should always prepare to switch up techniques when new information presents itself. TPM, LCA and AM/PM are not possible without access to real-time data on line losses and OEE, which can change at the drop of a hat. Does your company have processes in place to reallocate resources as needed in any eventuality? Speaking of resources, keep in mind that a commitment to TPM through LCA or AM/PM almost always includes upfront investment beyond the norm. This is not a sign of trouble. Quite the contrary, additional resources today lead to a leaner, cost-efficient future and a hand-over-fist return on whatever stakeholders put in. In the end, TPM optimizes resource expenditure so methods like LCA and AM/PM grow more cost-efficient and rewarding with every new line brought onboard. Q. What’s the difference between an Improvement System and an Innovation System? A. While both Innovation and Improvement take a systemic approach to implementation there are distinct differences. Today, in the improvement world-of-work, data is king. Data defines current state and points us to improvement opportunities. Just look at a Value Stream Map, it’s data rich! On the other hand, Innovation is not an analytical process, it’s a creative process where ideas reign supreme. Innovation is about ideas. Ideas provide the fabric for experimentation which leads to new ways of thinking and working and new products and services. An Innovation System transcends the company by considering the entire business model. While there is a difference between an Improvement System and an Innovation System, we don’t think they require uniquely different mindsets, you just need a bit of adjustment to your specific objectives and transformation process.